All of Tyler Wallach's products start out as one-of-a-kind paintings. Print on demand has become a profitable business or side hustle for many artists. Yet figuring out how to get started, choosing the right printer, and deciding how to market your new line of work can seem like an overwhelming challenge. We got some advice from two different artists, with two completely different styles, about how they translate their paintings onto housewares and wearables—and how it’s improved their business. Tyler Wallach likes to call himself the “1988 lovechild of Keith Haring and Lisa Frank.” From his inspirations he gleans the distinctive use of wild, colorful patterns in his almost psychedelic paintings. A magic and jump-rope enthusiast, Tyler’s eclectic style pervades both his work and his life. We got the chance to chat with Tyler about his colorful line of wearables. HOW DID YOU MAKE THE TRANSITION INTO CREATING FUNCTIONAL PRODUCTS OUT OF YOUR PAINTINGS? It felt so natural. My personal style was heavily influenced by the ability to utilize sublimation printing, which is a fancy term for a printing process commonly referred to as “all-over printing" where the design covers 100% of the garment. I’m infatuated with the printing process. I’m pretty tech-savvy, so I did all the design work, pattern creation, and file-formatting myself—it was a fun challenge. It started with sublimated t-shirts, then I created four bags, four leggings, eight more t-shirts, two tanks tops, stash bags, 3-D printed nylon necklaces, precious metal jewelry, shoes, journals, and stickers. I’ll be happy when you can buy a Tyler Wallach Studio backpack and lunch-box set for your favorite child. 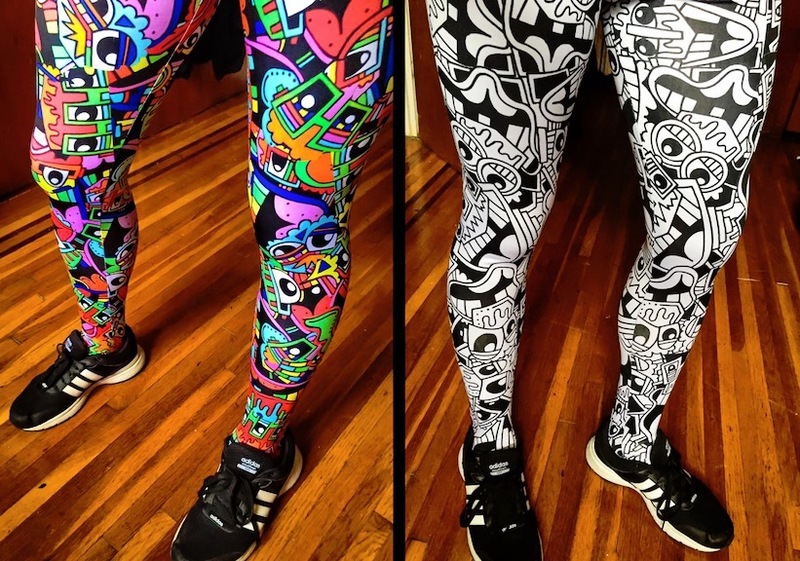 CAN YOU WALK US THROUGH WHAT THE PROCESS IS LIKE TO CREATE, SAY, THOSE AMAZING LEGGINGS? 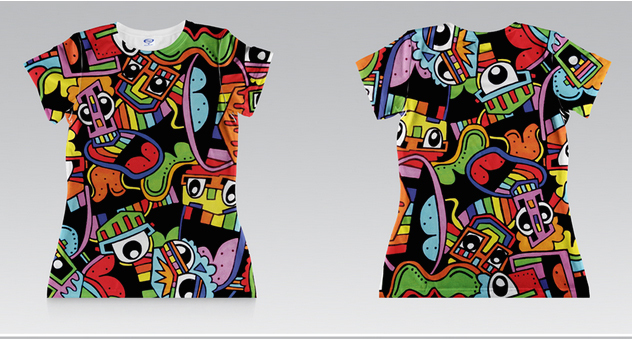 Everything I print onto clothing always, ALWAYS begins with a free-hand drawing or painting. I have produced 100% of the work with my own blood, ink, and tears. The first part of my creations are 100% organic, not pre-planned, and are done by hand. Then I either have high-res photos taken of the painting, or scan a drawing into the computer. I then manipulate the artwork in 100 different ways, and format it onto the patterns to be sent off for sublimation printing. I then order my samples, test quality, and put in an order so I can then photograph the garment on a model and start selling it! Tyler Wallach Studio Leggings are great for the gym, hitting the town, and yoga. HAS YOUR PRACTICE CHANGED AT ALL SINCE THE INTRODUCTION OF THE WEARABLE LINE? Business is better than ever! The best part about my art is that there is something for everyone. You may not want to wear a rainbow t-shirt, but you can own a painting at a reasonable price to improve your home space. I have products available from five bucks to 500 bucks. It directly aligns with Keith Haring’s philosophy, “ART BELONGS TO THE PEOPLE.” It’s not something that solely belongs in a museum or a stuffy art gallery on the Upper East Side. Art is supposed to make you feel something, everyone deserves to be bothered by art and forced to live a little. WHAT ADVICE WOULD YOU GIVE OTHER ARTISTS LOOKING TO START MAKING THEIR WAY INTO MERCHANDISING THEIR WORK? Stay humble and don’t sign anything until your dad looks at it first. These shirts from Tyler Wallach are sure to steal all the attention in the room. We got some advice from Artwork Archive artist Robin Pedrero on how other artists can start making functional works from their paintings. Artwork Archive artist Robin Maria Pedrero has also found a steady source of income from her ability to translate her paintings onto functional items such as pillows, shower curtains, and duvet covers. Through her whimsical aesthetic, Robin has built a customer base all over the world. HOW DID YOU MAKE THE TRANSITION INTO CREATING FUNCTIONAL PRODUCTS? I’ve always adored fashion. However, I never much enjoyed using a sewing machine. Social media has also offered up a lot of ideas—I am often asked if I have certain images in say, a shower curtain or pillow. This is what spurred the creation of functional products. There was a need to be filled for my customers who were asking for these items, and that led me to research how to get my artwork on other wearables like silk scarves, dresses, and leggings. CAN YOU WALK US THROUGH WHAT THE PROCESS IS LIKE TO CREATE PRODUCTS FROM YOUR PAINTINGS? There are so many ways that an artist can create products. One way is to be a published and licensed artist with places like SunDance Graphics, which is where I am licensed. Another way is to research companies that print on fabric or you find print-on-demand products. Today, the ability to do this is at an artist's fingertips. I recommend finding reliable companies with good quality products and excellent customer service. Each company has different guidelines for submitting your artwork and designs. All will require a high resolution image of the artwork. 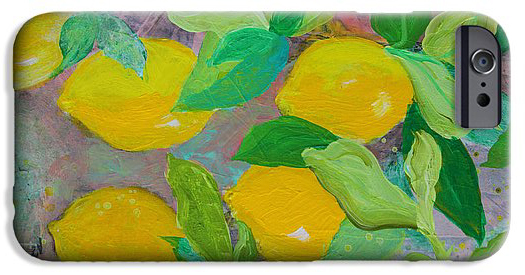 Robin turns her paintings into a range of functional objects, like these cell phone cases. HAS YOUR PRACTICE CHANGED AT ALL SINCE THE INTRODUCTION OF THE HOMEWARE LINE? Absolutely! I now envision and create art just for particular products. Interior designers and home décor shoppers look for certain color and subject trends. In creating artwork, I know that the dimensions are important as some sizes suit particular products better than others. Images or subject matter need to avoid falling too close to the edge or they will be cropped on printed versions. I have to use Adobe and my Surface computer pen a lot more often. I also need to incorporate décor and accessories into my marketing. It is fulfilling to know I have options for my customers and exciting when they share pics of how they decorate with these pieces. Artists looking to make their way into merchandising their work could apply to a publishing/licensing company or seek print-on-demand options. Research the companies to make sure they meet your expectations and are a good fit for your business. Learn to take great images of your art or hire a professional. Want to start merchandising your paintings, and need somewhere to keep it all organized? Try out Artwork Archive to keep your business in order. Artists answer the question, "What advice would you give your younger self?" Here are the lessons learned along the way. Leave writer’s block behind. Enjoy our art marketing writing guide and word bank to help you sell art more effectively. The very first steps to being a professional artist? Map out your road to success with our business plan outline for artists. Stay creative and get more done by cutting yourself some slack and easing transitions between the two worlds.